College football is in full swing. The usual teams have been dominating, and going into this year it looks obvious who’s going to do well. Alabama and Georgia have been taking turns dominating schools with their overwhelming amounts of talent on both sides of the ball. Clemson still has a very talented team boasting one of the best defensive front 7s in college football. They also have two talented quarterbacks in Kelly Bryant and Trevor Lawrence that they can pick from. Then you have teams like UCLA who are struggling to win games. It’s fair to say that teams like USC and Texas are in the same boat or a similar one. The thing that these specific teams all have in common is that they have the potential to be future powerhouses. A couple factors were taken in when I made this list of future powerhouses. This includes whether the team has a good young coach, prestige of the program, and the recruiting classes they have coming in or had from last year. This list is also put in order of teams who are more likely to have success sooner than later. Keep in mind this is week 6 of 15 for college football, so some of these teams still may have really good years this year. They just won’t be anywhere near the college football playoff conversation. Nebraska is currently 0-3 after close losses to both Colorado,Troy, and a beatdown by Michigan. It’s not exactly the ideal start to the Scott Frost era, but it would’ve been foolish to expect more from a team. This is a team that has struggled mightily the past couple years, and has been on the downswing for quite a while it seems. There’s a reason Nebraska is at 5, and it’s because they have quite a bit to go before they’re even considered anywhere close to being college football playoff team. Nebraska has a good football history so recruiting shouldn’t be too bad, but their recent history leaves a lot to be desired compared to the Tom Osbourne days. They have had at least three losses every year since 2002, which puts them well out of range to be considered a national championship contender. Cornhusker fans can only hope that Scott Frost can lead them back to the powerhouse they once were, and it’s not a bad thing to place faith in. There are only two reasons why Nebraska is on this list in the first place. The most important one being Scott Frost. Scott Frost is a good coach, and has been around a lot of good coaching minds as a former football player and coach. Seriously though, it’s almost impossible for him to not be a good coach after all the good one’s he’s been around. Frost has had the opportunity to learn from the likes of Bill Walsh, Tom Osborne, Bill Parcells, Bill Belichick, Mike Tomlin, and Jon Gruden. Frost is also a young coach at 43. It’s hard to believe that recruits won’t see Nebraska and being apart of the new Scott Frost era as an intriguing choice. Frost did make the most out of his time at UCF, and was a big part of the success Oregon had under Chip Kelly. Even after Chip Kelly left, Frost was promoted to offensive coordinator and helped Mariota to a Heisman year and Oregon to a National Championship berth. Speaking of quarterbacks he coached to success, Adrian Martinez may be his next successful quarterback. Martinez is currently starting as a true freshman, and he’s the other half of the reason why I think Nebraska will find success moving forward. Anyways it’s hard to believe he won’t make the most out of his time at Nebraska after making the most out of his chances elsewhere. Speaking of Oregon, Chip Kelly is back in the college game. It’s hard to deny that Chip Kelly won’t find success again at UCLA. Low key, UCLA has produced some great talent the past couple seasons but haven’t been able to put it together. Without Chip Kelly, they did have guys like Josh Rosen, Anthony Barr, Myles Jack, and both the Kendricks brothers. It’s extremely intriguing to see how they’ll do with a better coach who specializes in recruiting. As much as people hate on Chip Kelly, he did have some good years in the NFL. In addition, he had some great years in college. Despite not winning a national championship, Chip Kelly’s recruiting was always top notch. Recruiting is most of the battle when it comes to starting a dynasty or creating a powerhouse, and Chip Kelly has proved himself to be one of the best recruiters out there. Now that he’s equipped with NFL coaching experience, his recruiting may reach a whole new level of dominance. Chip Kelly’s situation reminds me a lot of the Nick Saban’s situation. Both did well in college football, left for the NFL, flopped, and then came back. Except Kelly’s situation is the west coast version of the story. Saban found a way to dominate the south in recruiting, while slowly spreading his reach as he grew his own legend on the field. Tua Tagovailoa is a direct effect success of the effect Nick Saban has had on college football all these years. Tua probably should’ve went to a west coast team but he got flipped. Look for Chip Kelly to do something similar, but dominating the entire west coast until his influential reach spreads east. Dorian Thompson Robinson is also an intriguing player to keep an eye on. Like Adrian Martinez he’s a dual threat quarterback who’s starting as a true freshmen. Right now UCLA has struggled, but it shouldn’t be much of a concern. This year isn’t going to be pretty for UCLA, and those are simply facts. Just keep in mind that sooner than later Chip Kelly will dominate recruiting again, and UCLA may turn into a powerhouse like they’ve never seen before. Saquon Barkley was a huge reason why Penn State was briefly in the conversation for the college football playoffs the past two seasons. It’s now the post- Saquon era, and although Penn State is 4-0 they were against very weak teams. I expect Ohio State to easily beat them, and I see them challenging Wisconsin, and Michigan but ultimately losing those as well. Either way, Penn State is simply not better or on the same level as an Alabama, Georgia, or even Kyler Murray’s Oklahoma. All hope is not lost though. They snagged a great recruiting class in 2018 with the #5 recruiting class in the country. This class includes three 5 star recruits in running back Ricky Slade, wide receiver Justin Shorter, and defensive end/linebacker Micah Parsons. The Saquon Barkley era will continue to benefit Penn State’s recruiting as they continue to climb back into college football relevance. 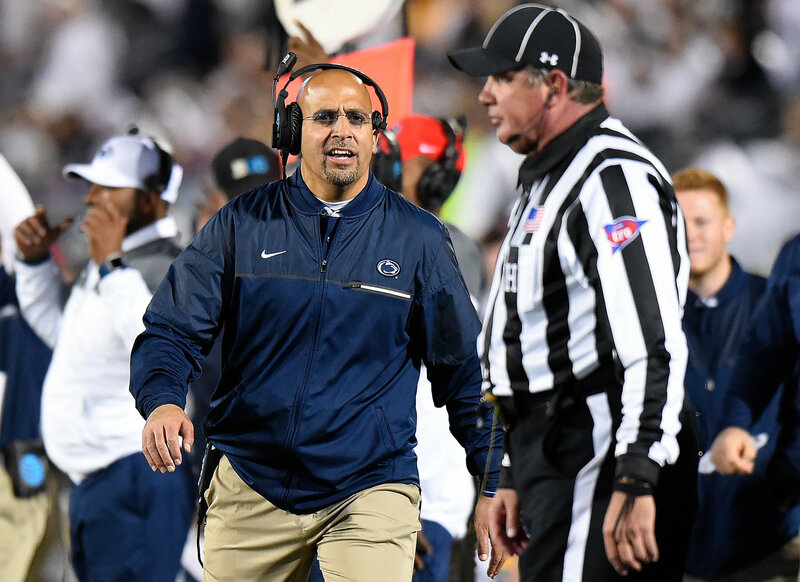 It also helps that coach James Franklin is one of the more respected coaches in the country, slowly rebuilding the once great Penn State program. So recruiting moving forward should get easier as they continue to have success. The fact that this is Penn State we’re talking about, and recruiting should be getting easier for this should be more than enough to make a case that this team will be very successful moving forward. Unlike UCLA, Penn State has a vast football history that they can use to continue to recruit great players. Many consider it tainted history, but nonetheless from a pure football perspective it’s hard to deny that the history still exists. Besides recruiting, Penn State also has one of the best young running backs to come out of college in Ricky Slade. Besides having a great name, Ricky Slade also has a lot of talent. He’s not exactly Saquon Barkley, but he’s his own player as a shifty/speedy running back. As a true freshman he has two rushing touchdowns through 3 games which isn’t bad at all for an 18 year old. They also have a junior running back in Miles Sanders who’s been tearing it up, so there is no rush with Ricky Slade. This year they should make a bowl, but don’t expect them to make the college football playoffs. USC has a young offensive group coming in after losing Sam Darnold, and Ronald Jones last year to the draft. They lost to Texas, but that’s not the worst lost they could have considering their situation. This is a program that hasn’t been as dominant as it once was in the 2000s but that can all change soon with the great recruiting class they had last year. Last year they had a whopping four 5 star recruits come in. 2 of those guys are starting for USC this year and are making a lot of noise. J.T. Daniels is their talented quarterback who has not been playing bad for the Trojans. Despite only throwing for 1 touchdown so far this year, he has thrown for 282, 215, and 322 yards respectively in the first three games this year. His former high school teammate Amon-Ra St. Brown has put up big numbers as well posting 98, 39, and 167 receiving yards in his first three games as a true freshmen as well. On the other side of the ball Olaijah Griffin (the other 5 star corner) has been getting playing time as well for the Trojans. As of now, he’s the only freshmen that I found that has played so far this season. Despite this, the Trojans still have a bountiful of young talented defensive players waiting for their chances. Players such as linebackers Talanoa Hufanga, Palaie Gaoteote, and Solomon Tuliaupupu are highly touted guys who will make a huge impact on the upperclassmen at their position move on. USC may not have the most talented coach on this list, but Clay Helton is definitely capable. He’s coming off an excellent recruiting year, and everyone knows once USC starts piling up recruits they just keep on coming. This is a young team, that may need one more year before they come back to being college football playoff contenders. Texas is above USC because Texas showed off in a beatdown on a ranked USC team this past week, winning 37-14. They defensively dominated the Trojans after allowing 14 points, and proceeded to shut them down the entire second half. Despite losing to Maryland week 1, Tom Herman’s Longhorns still found a way to bounceback. They probably won’t be considered to make the college football playoffs, but they do face some good teams this year that will test both Tom Herman and this young talented team. Texas did just upset 17th ranked TCU, in a game that may play a big role regarding recruiting. Looking ahead they also have battles against a 5th ranked Oklahoma team led by Kyler Murray who’s arguably the best quarterback in college football. They also face a tough currently 12th ranked West Virginia team led by Will Grier another great quarterback. It’s hard to see Texas beating Oklahoma or even West Virginia, but it’s not impossible. Winning those games will do wonders for a Texas team that has struggled to put it together, despite having a wealthy amount of good Texas recruits to choose from year in and out. Recruiting will not be hard for Tom Herman who’s a great recruiter. Notably he stole the best tackle in college football right now, Ed Oliver, from Texas back when he coached Houston. In addition, it is Texas and they have always done well when they dominate the state in recruiting. This past year they did just that taking the majority of the top players from Texas, which included the top 2 players from Texas in Caden Sterns and B.J. Foster. Those two players also happen to be in the top 25 best high school football players in the nation. Sterns is currently starting for Texas, and has been an immediate impact. Besides those two, Texas also snagged 17 four star recruits. The way Tom Herman is recruiting, and the success he’s already shown so far as a coach is very promising. In his first year he barely made it over .500, but he did beat Missouri in a bowl game against a talented quarterback in Drew Locke. That season marked the first winning season since 2013, and the first bowl win since Mack Brown’s last one in 2012. It’s hard to believe that Texas isn’t going to improve on last year’s record at the least, and use this year as a launch pad to their future success. Herman was a hot commodity in the coaching world, and Texas happened to be there to pick him up. This Texas team under Herman can be very good, and it’s really only a matter of time before Herman puts it together for them. As long as he keeps dominating the state of Texas recruiting wise, than it’s only a matter of time before Texas football is truly back.